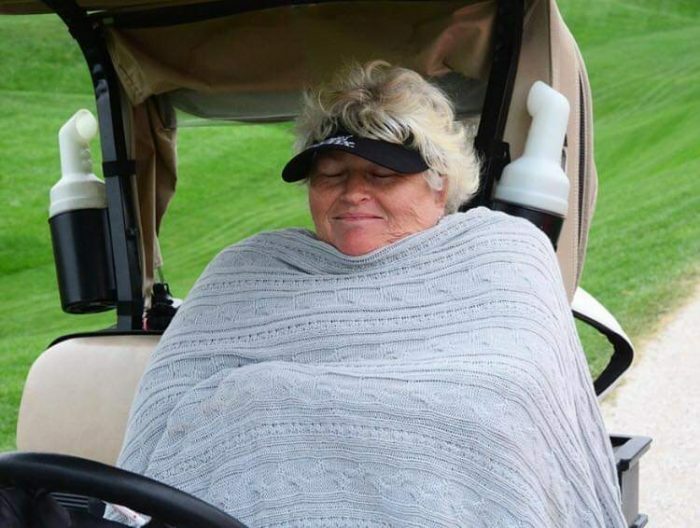 Mo is having a bit of a lie down this week – well, she’s in Ireland playing golf with some other old dolls – to recover from her Ryder Cup tour de force, so where better to start than with the Senior LPGA Championship. Presented, appropriately enough, by Old National Bank and played on the Pete Dye Course at French Lick, a rather grand resort in Indiana, it featured a field of over-45s that made me feel very nostalgic. All my yesterdays were there and I was delighted to be able to watch them (on the telly, hooray) battling away in ferocious conditions. The players had carts – I think it’s that sort of course – and there didn’t seem to be that many spectators but I suspect that was largely because it’s not much of a walking course and if the players are in carts, you’re never going to catch up. It was also Arctic, Baltic, blooming freezing and although the rain stopped and the sun came out eventually, it looked as though the wind scarcely let up. 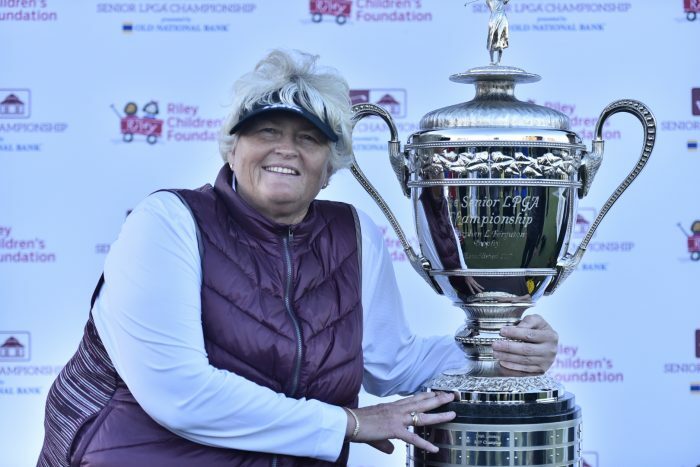 Dame Laura Davies, who’s just turned 55, was suitably imperious – she’s still competing regularly, unlike a lot of her contemporaries – and broke par in all three rounds to finish on 208, eight under. She finished four shots ahead of Helen Alfredsson and Silvia Cavalleri, who ended up missing the crucial putts that the grande dame holed, with Michele Redman the only other player under par, on 215. Trish Johnson, the defending champion, was a respectable 6th on 219, three over. It was great to see Alfie, still fidgeting and contorting into her trademark Body Swedish, still making a bit of a bog of putts she could have, perhaps should have holed, saying goodness knows what in Swedish to her husband Kent, once as big in ice hockey as Ian Botham was in cricket (I believe, rather hoping that ice hockey buffs will know bugger all about cricket and vice versa). And there was Lotta Neumann, muffled up against the chill but still managing to exude elegance. And Brandie Burton. Brandie Burton! Who knows what might have been if the big-hitting American, a Solheim Cup player who won two majors and lost to an inspired Laura Davies at Dalmahoy but beat her at The Greenbrier, had been blessed with better feet and ankles? She was very good very young, set to break every record going but her body let her down. She’s only 46 but was due to have her 20th, 30th, 40th surgery – not sure of the total but it is more than anyone would want in several lifetimes – just after the championship. She doesn’t play much these days but she had a 66, six under par, in the second round and finished 5th, on 217, one over par. Outstanding. Neumann, Maria McBride (nee Hjorth), Catriona Matthew, Europe’s Solheim Cup captain at Gleneagles next year and the combative American Rosie Jones shared 7th place on 220, four over par, which meant that there were two Englishwomen, one Italian, three Swedes, one Scot and three Americans in the top ten. Juli Inkster, who’ll captain the USA Solheim team, for the third time, at Gleneagles, shared 12th place with Jane Crafter, an Australian wine buff and TV commentator, now in her 60s (what a great decade! ), who is a passionate cheerleader for the senior women and their Legends Tour. Now it’s up to the R&A, so keen to promote the women’s side of the game, to do their bit and lob a British Senior Women’s Open into the mix. Over 45 or over 50? Decisions, decisions. What do you think? I’m inclined to go down to 45 but am willing to be persuaded either way. These senior majors are a real celebration of golf, a chance for a competitive get-together and a thank you to some of the pioneers of the game. Perhaps nostalgia is what it used to be after all. 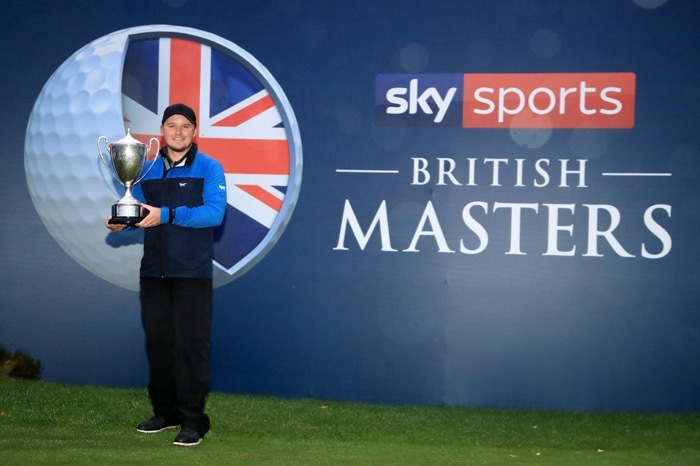 Congratulations also to Eddie Pepperell, fellow blogger, who ground out victory in the Sky Sports British Masters at Walton Heath, a proper, old-fashioned golf course that proved more than testing enough for today’s maestros. It was often wet and windy and not everyone learned quickly enough that heather is not to be messed with – ever. Sadly, however, there seems to be no one willing to sponsor the event next year, so Eddie might be polishing the trophy for quite a while. Finally, I’d better explain the cake at the top of the post. It was presented on Tuesday to Sue Marchant, who’s been a member of Whittington Heath for 50 years now and is still swinging away, fortified by a quick lesson from Mo a few weeks ago. Celebratory cake available on request until further notice. 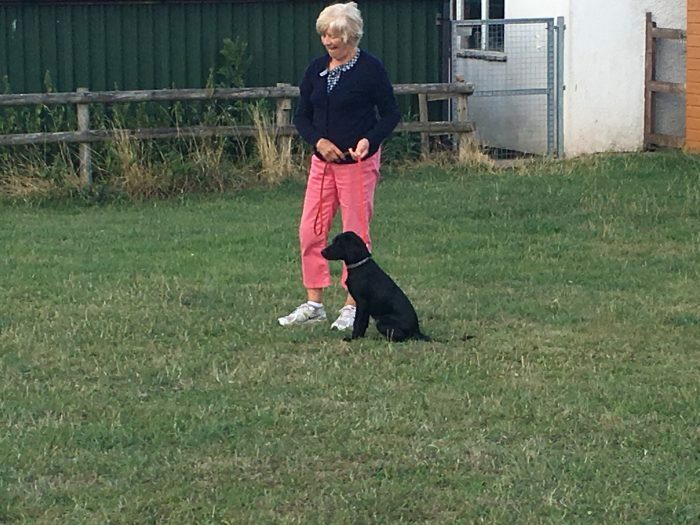 Sue (left) in training with Alice, for whom golf will probably always remain a mystery – no dogs allowed on the course at WHGC for some reason.